In all the hotels we stayed in,we found staff to be friendly and very helpful. Most spoke a good amount of English. Hotel is located in Aginaga village, 14 km from San Sebastian. Free Wi-Fi and free parking. Ensuite (Shower) air-conditioned rooms, some offering river and mountain views. Breakfast (Good continental, fresh fruit etc.) included. Hotel’s Sidrería offers a typical set menu or a varied à la carte menu of traditional Basque cuisine. €5.40 included in meal price covers unlimited, help yourself to, cider, Red, White, Rose or Cava. The €30 set menu is for 5 courses or you can choose from selection of tapas. Our meal worked out at around €15/person including wine and selection of Tapas & dessert. Hotel has no restaurant but offers breakfast at a supplement. We parked our car in their garage for €10/day (2014 rates) but they said on street parking was safe in the town. Rooms are ensuite. We ate in a restaurant 50 metres from hotel. €9.50 per head for 3 course meal with wine (2014 rates). There were choices for each course. Good home cooking. The town of Palas de Rei has a number of places to eat. Hotel does have a restaurant but we found somewhere in town. This is not a reflection on their restaurant, as breakfast buffet the next day was good. Staff in the hotel speak good English having spent time living in UK. Hotel is on the “main road” but the road is quiet at night. The hotel lies around a Kilometre from town centre. Rooms are ensuite, very clean and comfortable. Melide is renowned for octopuspulp “pulpa a la Gallega”. Anyone for lunch…? Hotel has 16 bedrooms, including two suites. The 14 bedrooms are located either in the Pazo’s main building or in small individual “cottages” with ground-level entryways leading to bedrooms with ensuite bathroom. We eat a very good meal in their restaurant. Good range of wines. Pre dinner drinks taken on terrace. Wi-Fi in public rooms and the outside terrace. Rooms were good standard. The pension is located at the far end of the town, which adds around 3 Km to the day’s walking. However, this time is it is just off the trail and so there is less to walk the next day! It is well sign posted from outskirts of O Pino. We found it to be simple but clean and very well equipped. Our room contained a good size double and a very nice en-suite shower room with large new shower. Area quiet at night. They only take cash. Breakfast was €5 and was good value. The hotel is around 2 Kilometers off the trial. When entering Lavacolla, continue until the main road. Turn right here and walk along the road and up the hill for around 1.5Kms. The hotel is sign posted off the road on the right (500 metres from the main road). Very comfortable rooms with ensuite. Hotel has no restaurant but owner will run you down to Lavacolla and pick you up with out charge. Breakfast is served in a separate room from main hotel building. Hotel is a little Spartan and rooms not that large but clean and OK for a night or two. Building retains the old monastery atmosphere. Breakfast is good. Location is top notch. However, if you can get into it, we would suggest the Parador hotel, also next to the Cathedral. More expensive but, we are informed, worth it. Hotel is located in one of the pedestrian streets very close to the cathedral. Quiet at night, the rooms were large, comfortable with a good size modern bathroom ensuite. We only took breakfast in the hotel restaurant, but it was of a good standard. Staff were helpful and friendly. Being so close to the cathedral, finding somewhere to eat in the evening was easy, with a large choice of restaurants within a 5 minute walk. Although the Casa de Bola is a kilometre or so from the Camino, the owner arranges to collect you from the Camino in Negreira, which was very welcome! The owner simply could not have been more welcoming and helpful. He is proud of his family home and rightly so. It is beautiful and full of character, yet every possible amenity had been thought of. The room was large and very comfortable, with a lovely view of the garden. Free wifi was provided and we were told to help ourselves from a fridge full of water, soft drinks and beer. The owner drove us into Negreira in the evening and he showed us a choice of restaurants. He then told us to telephone when we were ready and he came back to collect us. Breakfast was amazing - ham, cheese, fried eggs, yoghurt, fresh fruit, freshly squeezed juice, tea/coffee and baked goods. The owner also drove us into Negreira in the morning, so that we could use the bank machine and then took us back to the Camino. The young couple who run this hotel could not have been more helpful. They arranged a taxi to collect us from the Camino at Santa Mariña on the first night and we were dropped back the next morning. The chef collected us the next evening and he dropped us off the following morning, after a little sightseeing tour. The room, on the ground floor with a view of the garden, had everything we needed, including a hairdryer. We were offered tea and cake in the afternoon. Breakfast was amazing, with a buffet of ham cheese, yoghurt, fresh fruit, cereal and baked goods. Freshly squeezed juice and tea/coffee were provided. We ate in the restaurant both nights. The food was just exquisite. We had several dietary requirements but these proved to be easily dealt with. Several tapas dishes were served as a starter, followed by a main course and a dessert. Every mouthful was a triumph. The hotel has a wonderful view of the lake below and has a lovely little garden and terrace. The hotel is situated one street back from the coast road on a quiet street. Rooms were comfortable, large and airy. Our room featured a private, very large terrace with comfortable patio furniture and views over the estuary and town. There is no restaurant, but the town is just a few minutes walk away with a choice of restaurants. Breakfast is served downstairs and was comprehensive. Light snacks are available at predetermined times. The owner speaks several languages including English. Hotel is just back from the beautiful Langosteira beach, some 3kms long. It is a modern building, with comfortable rooms, ensuite facilities and private balconies to most rooms. Staff were very friendly and spoke English. On one occasion, they collected us from the centre of town, a fair distance away, without charge. Hotel had a resturant, but we eat in the town, except for breakfast, which was a wonderful spread. Hotel is located inside the city's pedestrian area and thus you need to call the hotel once you arrive at the barriers for them to lower it. The hotel had on-site parking. The building is a working monastery and hostel for Pilgrims as well as a hotel. Rooms are large, air conditioned and double glazed, with ensuite facilities. Opposite the hotel is a large plaza with a bar. Centre of town is 5 minutes walk away. Breakfast was typically Spanish but plentiful and regularly refreshed. It is in a very quiet section of town with very limited vehicular traffic. The streets are lined with cobble stones and very old houses that give you a genuine feel of what old Leon must have been like. The scallop shell has long been the symbol of the Camino de Santiago. Over the centuries it has taken on mythical, metaphorical and practical meanings, even if its relevance may actually derive from the desire of pilgrims to take home a souvenir. The two most common fables concerning the origin of the symbol both relate to the death of Saint James, martyred by beheading in 44 AD Jerusalem. The first version is that after James' death, his disciples transported his body by ship to the Iberian Peninsula to be buried in what is now Santiago. Off the coast of Spain a heavy storm hit the ship, and the body was lost to the ocean. After some time, the body washed up ashore and undamaged, covered in scallops. The second version is that after James' death, a ship mysteriously transported his body with no crew back to the Iberian Peninsula to be buried in what is now Santiago. As James' ship approached land, a wedding was taking place on the shore. The young groom was on horseback, and on seeing the ship approaching, his horse got spooked, and the horse and rider plunged into the sea. Through miraculous intervention, the horse and rider emerged from the water alive, covered in seashells. 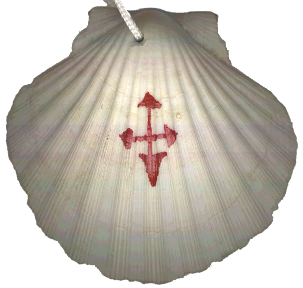 The more probable reason for it becoming the symbol of the Camino is that scallop shell served a practical purpose for pilgrims on the Camino de Santiago. It was the right size for gathering water to drink or for eating out of as a makeshift bowl. It also acted as a badge denoting that the person was a pilgrim, thus offering protection from attack and access to free board and lodging. The scallop shell also acts as a metaphor. The grooves in the shell, which come together at a single point, represent the various routes pilgrims travelled, eventually arriving at a single destination: the tomb of James in Santiago de Compostela. Today, as the symbol of the modern Camino de Santiago, the shell is seen frequently on posts and signs along the Camino guiding pilgrims safely along the way. It is even more common to see it on the pilgrims themselves. Wearing a shell denotes that one is a traveller on the Camino de Santiago. Most pilgrims receive a shell at the beginning of their journey and either sew it onto their rucksacks, wear it around their neck or by simply keep it in their backpack. 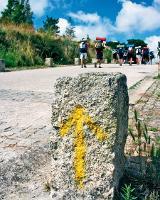 Also visible along the modern Camino are the yellow arrows signifying the correct direction to follow along the route. Elijah Valina, pastor of Cebreiro, pioneered these arrows. He began marking the route to keep pilgrims safe on the final leg of the Way of St. James. (O Cebreiro is 155kms from Santiago). Later other people took up his idea and today, the yellow arrow is visible all along the Camino. The Camino de Santiago or the Way of St. James is a spiritual journey that pilgrims of all faiths and backgrounds have traversed for over a thousand years. The pilgrimage originally began at one’s doorstep, though modern trekkers today would find that rather difficult, particularly American pilgrims needing to cross the Atlantic. While there are a number of established routes leading to Santiago from all directions, the most popular is the Camino Frances, which crosses the Pyrenees Mountains along the Spanish-French border starting in St. Jean Pied de Port. This Camino route covers 800 kilometres that traverses an idyllic northern Spanish countryside. By following the yellow painted arrows marking the road, a pilgrim can expect to walk 12-15 miles a day to reach the next town for the night. At this pace, a pilgrim can reach the Cathedral de Santiago in 6 to 8 weeks time to attend the Pilgrim's Mass held at noon each day. Some take more time, others less. Some choose to travel by bike, and some have done the Camino on horseback. Along the way travellers encounter albergues, refugios and casa rurals that cater specifically to the thousands of pilgrims of all ages that take this journey each year, immersing themselves in the local food, culture and history dedicated to this experience. Pilgrims walk the Camino for various reasons. Some to seek penance, others enlightenment, and still others for a sense of adventure, yet all progress toward the Cathedral in Santiago where it is believed the remains of the apostle St. James are held. Most pilgrims choose to carry a scallop shell with them to symbolize their journey in honour of St. James. According to legend, scallop shells are said the have covered St. James’ body after it was found on the shores of the Galician coast. Another, perhaps more useful symbol is a walking stick to aid a weary pilgrim on his or her journey. Most pilgrims also carry a document called the credencial, purchased for a few euros from a Spanish tourist agency, a church on the route or from their church back home. The credencial is a pass, which gives access to inexpensive, sometimes free, overnight accommodation in refugios along the trail. Also known as the "pilgrim's passport", the credencial is stamped with the official St. James stamp of each town or refugio at which the pilgrim has stayed. It provides walking pilgrims with a record of where they ate or slept, but also serves as proof to the Pilgrim's Office in Santiago that the journey is accomplished according to an official route. The credencial is available at refugios, tourist offices, some local parish houses, and outside Spain, through the national St. James organisation of that country. The stamped credencial is also necessary if the pilgrim wants to obtain a compostela, a certificate of completion of the pilgrimage. Regardless of whether a pilgrim’s journey begins for religious, spiritual or cultural reasons, the meditative nature of the Camino offers the perfect landscape in which to dedicate contemplation. Pilgrims follow the path amidst the villages, towns, rivers, mountains and fertile valleys that have changed the lives of millions of pilgrims who walked before them. It had always been Martin’s dream to walk the Camino de Santiago. After having the privilege of holding Mother Theresa’s hand, sitting with Pope John Paul II at the Vatican, visiting the holy shrine at Lourdes, and making a film in Medugorje, his next wish regarding his faith was to visit the Cathedral de Santiago by way of its namesake pilgrimage. He was in the middle of his 7-year tenure playing U.S. president Jed Bartlett on the West Wing when he seized a tiny window of opportunity to realize his goal, at least in part. After attending a family reunion in Ireland in the summer of 2003 that celebrated his mother’s lineage, he had a moment of inspiration. He convinced a few family members to fly to Spain in honour of his father’s heritage as well by touring the Way of St. James toward Galicia, his father’s homeland. Unfortunately, seven days was all Martin had before needing to return to work in Los Angeles. Knowing this wasn’t enough time to walk the Camino, he pushed forward presuming it was now or never. Upon landing in Madrid, he rented a car with friends and family and set out on a northern path toward the nearest Camino town of Burgos to visit the famed Burgos Cathedral built in the 13th century. From there they hugged the Camino west as best as possible via major highways, detouring at important locations to walk a bit each day. By the end of their trip they arrived in time for the Pilgrim’s Mass at the Cathedral de Santiago. The beauty of the northern Spanish countryside proved too magical to experience in such a short period of time. Martin pledged to return one day soon for a proper pilgrimage toward Santiago. Through a series of on-going conversations between Emilio and Martin, the two decided to create a tribute to Spain to rediscover the land where the Estevez family was rooted. The Camino de Santiago served as the perfect partner in their efforts. 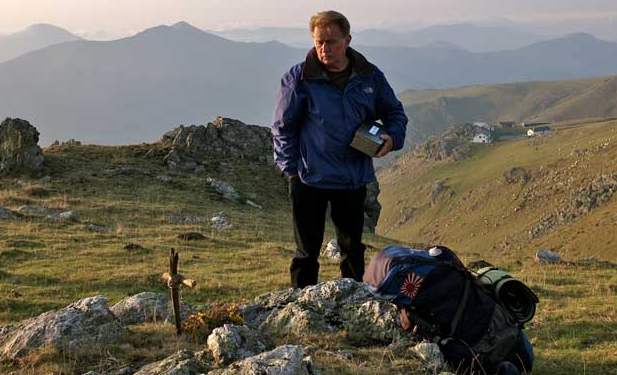 And while Spain serves as the backdrop, the film’s primary theme of self-discovery belongs to everyone from all ages and backgrounds, as does the Camino, which has helped transform the lives of millions of pilgrims for centuries. In the film, a father unfortunately comes to understand his son’s life through his death and along the road finds himself as well. The main protagonist of the film is the conflict we each have within ourselves of choosing a life versus living a life. This greater question of finding oneself is a matter of acceptance and choice. Given the circumstances of our lives, how do we understand ourselves, our family and our friends, and the choices we make? Do we blindly go through life unaware of our actions and how they affect not only ourselves but others, as well? What role does our community; friendships and faith play in our decisions? The Camino, by its nature, serves as the ultimate metaphor for life. Footsteps along a well-trodden path may be our guide, but do not shield us from the questions that most of our busy everyday lives prevent us at times from fully recognizing. The road offers very little to hide behind. The process of life is life along whichever road, path, Camino, or Way we find ourselves on. Our humanity toward ourselves and others, our history and our future is what defines us. Take the journey of life.